A Foodie Bibliophile in Wanderlust: Teachers, I need your help. One morning this year, it really snowed. We rarely get snow here, and we were super excited about our SNOW DAY! As I am pulling out our homemade sleds I realize that our district did not cancel school(which is unheard of here!) I pouted all the way to school! As I am walking into my classroom, one of my students almost tackles me and yells, "My wish came true! I get to play in the snow with you!" That is why I stay. No matter how bad things get, the students bring me back to what is really important-them. You have to do it for them. If you are in it for any other reason, it won't be enough. I have a passion for a group of children. Children who walk into a school year and may have already mastered up to 90% of the curriculum that will be taught that year. 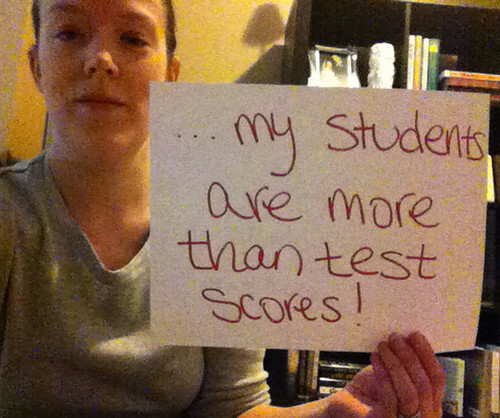 I believe every child has the right to LEARN every day - even kids who need to move beyond the grade level curriculum. They deserve to have the same chance to struggle, be challenged, and learn how to work hard to learn. Thankfully, my job allows me to work with these students. I still have freedom to be creative in my lessons and to expect creative and interesting responses from them. Each day I create, and they create, and we create together. I'm here to help them find their passions so they can make a difference in the world. That is why I teach. I stay because I honestly believe that I influence lives...and they influence me. I believe that students will become healthier academically, emotionally, mentally, and socially because they know me and because I care about them. I have seen education shift the trajectory of a student's life, and students have shifted my life's trajectory. That is the beauty of teaching. I stay because I've had "non-readers" stop me in the hall to tell me they cried during a book, tell me they are reading on a higher level than they ever have before AND ENJOYING IT, tell me they loved the book I recommended and can I help them find something else. I stay because my students have become like my Young Adult Book Club and I get paid to hang out with them. Good morning. Thanks so much for sharing my video! I would love to add to yours and will work on my picture this afternoon. It won't be in my classroom, since I am in Finland and my classroom is in New York, but I will try to find a nice backdrop. Can't wait to see your video when you finish! Oh! I'm in! When do you need it by! Thanks! I'd like it by this weekend if possible. Are you still looking for pictures? I'm on spring break this week, so it will need to be at home. Is that ok? I'm happy to help. It sounds like a terrific project! Yes! Send me something! :) It doesn't need to be in your classroom. I stay because I love my job! I started teaching in 1985 in Maryland and teaching has taken me literally around the world (I have taught in Asia, Europe, and the US). I am happy to be in a school where I can teach and not just follow someone else's script. 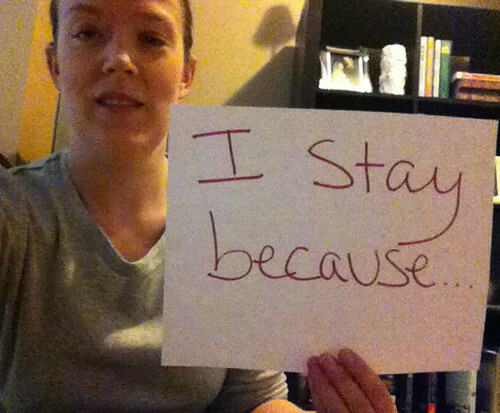 I stay because every day what I do matters. It's that simple and that huge.